The Guardian is reporting: “The president of Vanuatu says climate change is contributing to more extreme weather conditions and cyclone seasons, after cyclone Pam ripped through the island nation. 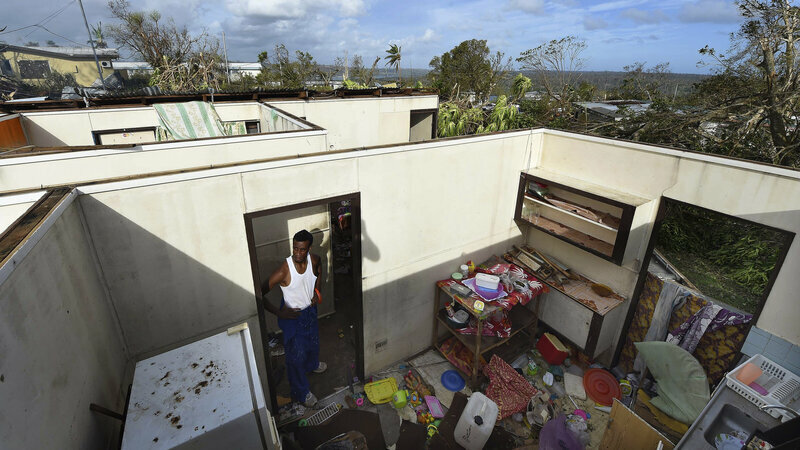 “The damage from the category five storm to the island nation has been extensive, and is still being assessed as aid workers scrambled to get to affected areas on Monday morning. “The official death toll remains at six, with many more injured, and is expected to rise as communication begins to be restored. “Vanuatu’s president, Baldwin Lonsdale, spoke at a United Nations world conference in Sendai, Japan, on Monday, and said the storm was a major setback for the people, virtually wiping out Vanuatu’s development.” See from “Democracy Now!” this morning: “Vanuatu Blames Global Warming as Cyclone Causes Nation’s Worst Climate Disaster in Recent Memory.” The program reports that half the country’s population has been made homeless. Dorsey is interim director of energy and environment at the Joint Center for Political and Economic Studies and a co-founding board member of Islands First, a nonprofit organization dedicated to helping small island nations protect the Earth’s climate and oceans. He said today: “The destruction in Vanuatu, in the aftermath of Cyclone Pam reveals the catastrophic nature the unfolding climate crisis has on human lives, economies and the environment. “Cyclone Pam, a Category 5 storm, simply devastated Vanuatu. The storm lashed the tiny country with winds of up to 160 mph; destroyed thousands of homes; knocked out power and telecommunications, and left an estimated 60,000 children in need of humanitarian assistance. “In theory, a warmer world should indeed produce more potent cyclones. Yet the Intergovernmental Panel on Climate Change (IPCC) estimates that the frequency of cyclones may stay the same or decrease while their average intensity goes up. The increased intensity of cyclonic activity might cost over $9 trillion dollars by century’s end: enough to buy all the real estate in Manhattan 12 times over. “A cyclone is somewhat akin to a traumatic brain injury, albeit to a country. Countries that apparently ‘recover’ after the storm may seem fine, but underneath they continue to struggle. New Orleans 10 years post-Katrina is a telling example: just ask the many people who have never returned to the city — and may never. “Immediately the U.S. needs to join the humanitarian effort led by New Zealand and Australia. For background, see: “Climate change brings disasters on steroids” and from late last year: “Pacific Climate Warriors in Australia to protest coal industry” about activists from Vanuatu canoeing to Australia to protest that country’s emissions.